Stephen Bunting has stepped in to replace Gary Anderson in the BetVictor Darts Masters which is being staged at Milton Keynes this weekend. 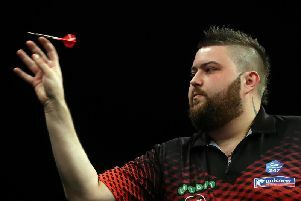 The St Helens arrow smith's lucky break follows the decision of Scotland's two-times world champion to withdraw due to a back problem which has dogged him since the world championships in London. Bunting has been invited into the tournament under PDC rules as the next highest ranked player in the Order of Merit and will meet Darren Webster of Norwich tomorrow night (Friday) in a first round match. He also joins St Helens-born Dave Chisnall and Michael Smith in the competition. The quarter finals will be staged on Sunday afternoon followed by the semi-finals and final on Sunday night.